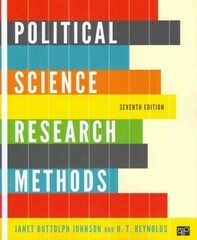 Political Science Research Methods 4 Edition Political Science Research Methods set the standard for being relevant, comprehensive, and ever-mindful of its student audience. With the seventh edition, the authors further refine their popular text to be more welcoming and more intuitive than ever--an ideal gateway to understanding not just the "how" but also the "why" behind research in the discipline.Updates to this new edition include:- new case studies of political science research in chapter 1--from causes of income inequality, to repression of human rights, to judicial decision making--that serve as touchpoints throughout the book;- updated discussion in chapter 2 about the empirical approach to political science;- a heavily revamped chapter 3 with clearer guidance on how to develop research questions along with steps for doing a literature review more appropriately placed earlier in the text;- new extended case study on polling and the health care debate in chapter 7 on sampling;- greater explanation of how to do content analysis in chapter 9 on document analysis;- separate chapters for descriptive and inferential statistics step out instruction and increase accessibility; and- a brand new annotated research article in chapter 16.Bolded key terms, a glossary and explanatory charts, figures, and tables help aid students learning. "Helpful-hint" boxes give students nuts-and-bolts reminders they can refer to when conducting their own research.